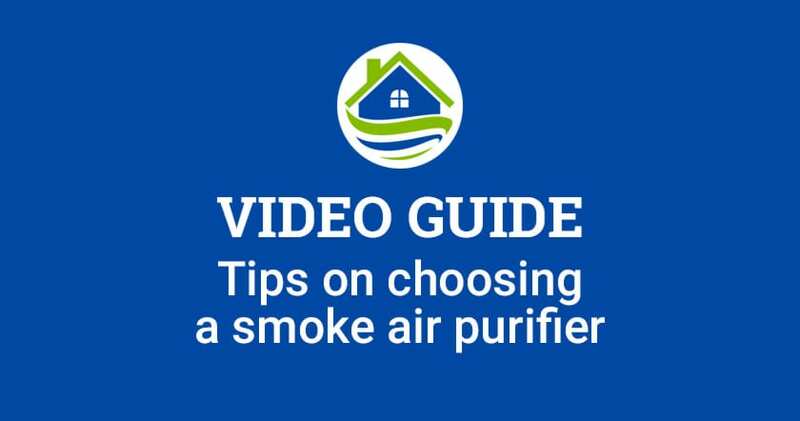 If you’d like to learn more the air purifiers mentioned in the video and how each one can help remove smoke in your house, take a look at our free guide on the best air purifier for smoke. Are you looking for air purifier to help get rid of smoke, but not sure which one to get? Do you want to remove cigarette smoke or cigar odors indoors so your home smells fresher and cleaner? In the next few minutes, you’ll learn what the top features are to look for in a smoke air purifier as well as the two best products you can buy today. It’s no surprise that tobacco smoke is one of the toughest odors to get rid of indoors. It clings to everything! Fortunately, using an air purifier inside your home can drastically cut down on the smell of cigarettes and cigars, and keep your home smelling fresh even if someone continues smoking in it. However, there are a few key features you’ll need to look for to make sure it effectively tackles smoke. When you’re shopping for an air purifier to help with smoke, the first thing you want to look for is one that uses a True HEPA filter. This filter is the only type that’s certified to remove 99.97% of contaminants as small as 0.3 microns. This includes the particles that make up visible smoke. The second thing you want to look for is an Activated Carbon filter. This filter is specially designed to absorb tobacco odors. You also want the biggest and thickest filter possible because the more activated carbon the filter has, the better it deodorizes against smoke. A third optional feature you may want to consider is a smoke air purifier that includes an ionizer. What this technology does is sends out negative ions into the air to neutralize the particles that make up smoke. It also helps extend the life of the internal filters. Now that you know what features to look for in an air purifier, here are the top two products you can buy today. Number one is the Rabbit Air MinusA2. This product includes a BioGS True HEPA Filter, Activated Carbon Filter and Ionizer to get rid of every trace of smoke. It’s also wall mountable and comes in a variety of colors and designs. It handles large rooms up to 700 square feet, and is one of the top air purifiers available for smokers. Number two is the Austin Air HealthMate 400. This powerful device includes a True HEPA filter and 15 pounds of Activated Carbon which is unmatched in the marketplace. Tobacco odor doesn’t stand a chance against this machine. The caster wheels let you roll it from room to room and it covers the largest amount of space, up to 1,500 square feet.